Are You Ignoring The Silent Scream? Whether it is romance, business, or friendships, if you have to pump someone to email or call you for answers more then twice, its time to accept their answer is in their silence. 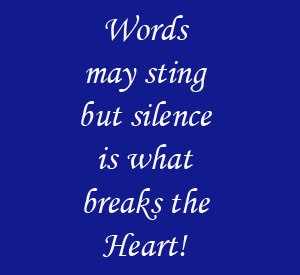 Silence screams are louder then words. Choosing to not understand someone’s silence is just simply denial on your part. Here are some of the excuses people use to make themselves feel better when someone’s silence is “screaming”. • There are too many people around for privacy to get back. • They can’t hear your knock on the door. Here is what not to do when someone’s silence is screaming louder then words. • Do not check your email or cell phone every hour, go out! • Do not buy them gifts just in case they communicate. If you have not heard back, and you are going into high anxiety…it’s a done deal. Think seriously about doing the following. • Block your thoughts of the one screaming silence. • Do not allow fantasies to make the relationship real for you. People Often Feel Despair At The Silence. We are entitled to despair. It’s ok to feel this when we are ignored. • What is not OK is to live in despair constantly in a state of waiting. • Trust that the Universe has another plan for you; a better one. • Life is a test. Always remember when the odds seem against us, and the bumps in life come one, after another; treat it like a car wreck. • Loosen up and roll with the flow. • A peaceful state of acceptance of the situation, when we have tried our hardest, often makes US more bearable for others….MOST OF ALL OURSELVES. • Soon, you will see new options. It’s called survival. • The more we waste time crying over the odds, the more we actually sabotage ourselves. An expert on survival in the jungle said there are 2 stages a person goes into when lost in the jungle, before they hunker down to the business of living..
Let’s choose survival when the odds are against us, or when someone’s refusal to value us as a person puts us in despair. Life is a test, and each failure is just a pass to the next stage of wisdom and improvement. You can do it! There is a wonderful world out there full of fresh opportunities.